Support mechanisms for renewables are crucial for successful deployment. They come in all shapes and sizes. The most common ones are: 1. Tax based mechanisms; 2. Obligation systems; 3. Fixed price feed-in systems. Even before any of these systems come to be meaningful there are a raft of other issues that control deployment of renewable energy (RE). For instance: how open is the electricity system? Is there adequate grid to allow connection? Are the regulatory and consenting rules appropriate for the deployment of renewables? In general we can say that the more work Government does in terms of consenting, grid allocation and speed of decision making, the quicker and more effective will be the deployment of RE. Later blogs will deal with these issues in detail. At this time the important thing to say is that, with Government commitment any support mechanism can be made to work. This is particularly so when the government sets definite RE penetration targets. Support Mechanisms – the good the bad and the ugly: 1. Tax based support schemes all involve a transfer of resources from central budget to the electricity consumer. As such they are reviewed each year at Budget time. This leads to an uncertain investment climate for the supply chain. Despite these potential drawbacks and, as has been proved in the US, tax incentives can be made to work; 50,000MW have been installed there, driven largely by the Production Tax Credit (PTC) scheme. 2. Obligation systems have been the norm in Texas and the UK. In these systems support payments come from the electricity customer. Companies within the electricity supply industry are incentivised to install a certain percentage of RE and, the percentage is often increased each year. If a company fails to meet its target it is penalised. But this is sometimes not all: in the UK for instance, there is a further sting - the penalty incurred by the non compliant company is distributed among those companies who meet their targets. Typically a price is placed by Government on a Renewable Obligation Certification (ROC). This price is £30 per MWh (mega watt hour) in the UK. Because a compliant company will receive a “donation” from a non compliant one, a secondary ROC is created. Its value is approx £15/MWh. In practice the RE developer who has a project ready to build contacts the electricity supply companies. They know that, to them, the output from a built wind farm, for instance, is worth: a) The value of the electricity coming from the farm plus; b) The value of the fines foregone i.e. the ROC plus the Secondary ROC. The scheme is flexible. In its latest form in the UK for instance, on-shore wind attracts a support of 0.9 x ROC whereas offshore wind attracts 2 x ROCs (plus in each case the proportional secondary ROC). The ROC scheme works, just as the US Tax P.T.C. does. However it is expensive. The support element rides on top of the electricity price. This effect is outlined in the following graph: The blue is the electricity price; the red is the total value of the support, i.e. the cost of wind. When a bank or a pension fund considers lending to a renewable project they look to the projected cash flow from the project. They see a variable. Their interest and capital repayment programmes rely on a future variable price of electricity. This variability is caused by price volatility - of fossil fuels. Banks want to see interest payments covered, with some spare capacity, by the cash flows, in each and every year. Because of the variability in the base price for electricity they lend less than they otherwise would. They lend against point A and not against B. 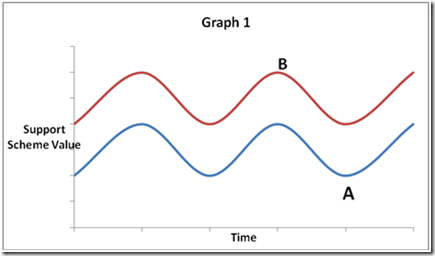 More precisely they lend against the lowest point on the blue line, plus the difference between the red and blue lines. This difference is fixed. It is the ROC value plus the secondary ROC value. The net result is less debt is lent. More equity is deployed. Returns on debt are 6 – 9%. Returns on equity are 15 – 20%. The more debt in a project the cheaper it will be. There is therefore a design flaw at the core of the ROC scheme. Put another way, lenders are forced to take fossil price risk. 3. The final support scheme is the Fixed Price feed in system. Under this arrangement a fixed price is paid for each unit of electricity produced. It is by some distance the most appropriate support mechanism. Here’s Why: a) The cost of building, operating and maintaining a wind or solar installation is fixed (almost). There is a small element of consumer price increase involved but this is of the order of a few percentage points. As this is only related to the initial capital cost the price is actually fixed in time. b) There is no element of fossil price risk in the price the electricity customer pays for RE. c) On account of this the price risk on the entire electricity system is reduced. If the system had 20% wind and 80% fossil then the combined risk would reduce from 2.825 to 1.81*. 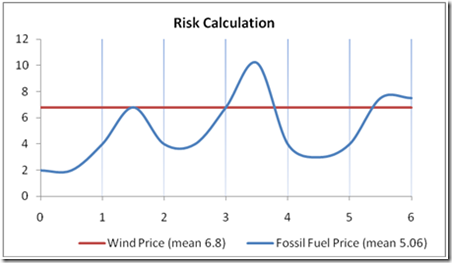 These figures being the variance (riskiness) of a fossil only system (2.825) compared to the variance on a wind fossil system. By itself this reduced risk reduces the electricity price to the customer. The price reduction depends on the efficient horizon, which in turn depends on the plant mix on the system. In Scotland, Awerbuch showed that if the wind penetration went from 21 – 32% then the cost to the customer reduced by 6%. d) Funders see a fixed price with zero variability. The only risk to cash flow is the annual variability in wind output. (This is common to all support schemes). They take no market risk, no fossil price risk, lend more debt, reduce equity exposure and thereby deliver cheaper electricity. e) Wind on the system always reduces the instantaneous (marginal) cost of electricity. In some instances it can reduce the price to near zero. Thus a wind asset owner who relies solely on market prices can find his revenues cut. There have been many cases of this. A fixed price feed in system gets over this. This reasoning has a particular relevance to the current debate on E.M.R. in the U.K. *Based on formula Var(AB) = Var(A). (WtA)2 + Var(B). (WtB)2 + 2 WtA.WtB.Cov(AB) where Var(AB) is the risk of the combined wind fossil system Var(A) is the risk of the fossil only system Var(B) is the risk of the wind only Wta is the weighting of the fossil fired plant on the system Wtb is the weighting of the wind plant on the system Cov (AB) is the covariance of fossil and wind or how the riskiness of one influences the risk of the other 4. What about Contracts for Difference? The C.F.D. price as proposed for wind looks like a Feed in Tariff in some respects. However from the vantage point of the funder there is no clarity about how the reference point is calculated on an hourly basis. A C.F.D. or contract for difference relies on there being a transparent price from which to calculate the difference. This lack of transparency can be designed out. In some hours there will be a sufficient number of trades to calculate an ungamed base price (say 20). At other times e.g. night or on weekends there may be insufficient data available. In these cases the full price will be paid. Cost recovery can be arranged in an annual balancing exercise. This would create a fixed price feed in system. Funders would have no objection as they would see a fixed price. Ergo, maximum debt at lowest margin. Ergo, quickest deployment and cheapest price to customer.